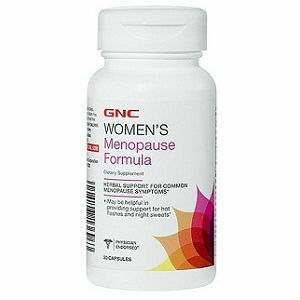 GNC Women’s Menopause Formula is an herbal formula, which reduces the occurrence of common menopause symptoms like hot flashes and night sweats. Black Cohosh root extract (Cimicifuga racemosa): Rich is phytoestrogen, which prevents the body from reacting to the lack of estrogen that normally occurs during menopause. It prevents menopausal symptoms like hot flashes, night sweats, etc. Soy isoflavone concentrate: Isoflavones have estrogen-like properties that relieve menopause symptoms like hot flashes and night sweats. Also keep the cardiac system healthy. One capsule can be taken daily as a dietary supplement. This supplement contains soy and wheat and may cause allergic reactions in some people. The listed price for each bottle is $18.99. However, for members of the website, a special member price of $15.19 is offered. In addition, a flat shipping charge of $3.99 is charged for purchases within USA. Membership costs $15 per year. The company offers a standard 30-day money back returns policy. If you are dissatisfied with the product, you can return it, used or unused, within 30 days of purchase and the purchase value minus shipping charges will be refunded to you. Jackie Horowitz	reviewed GNC Women's	on April 28th	 and gave it a rating of 2.5.